If you face a tax debt because your spouse (or ex-spouse) failed to properly file personal or business income tax returns, or failed to properly declare income or deductions, you may be entitled to relief from tax liability as an innocent spouse. You need an experienced lawyer to review your case and help you take the steps necessary to protect your rights. 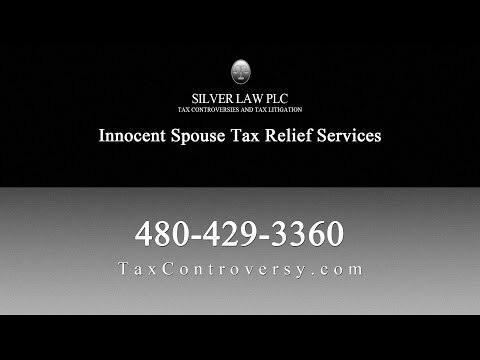 At Silver Law PLC, in Scottsdale, Arizona, our attorneys are all former IRS lawyers who offer more than 80 years of combined tax law experience to individuals throughout Maricopa County. We know what the IRS looks for when granting relief to an innocent spouse and will work closely with you to help you get the relief you are eligible to receive. To set up a meeting, contact our office or call us at 480-429-3360. We have a comprehensive understanding of the rules and the process of helping innocent spouses obtain relief from tax liability. If you filed a joint return, but were unaware that your spouse had misrepresented information in the return, or that information was incorrect on the return, we can help you seek relief from the resulting obligation. We also protect the rights of “injured spouses,” people who have signed joint returns believing that their spouse was filing the returns, but for whom no returns were ever filed. We work closely with you to mitigate or eliminate any fines or penalties that come with a late filing of the return. To fully benefit from the innocent spouse relief provisions in the Internal Revenue Code, it is critical that you contact an attorney as soon as you receive notice from the IRS. There are specific time limits for raising the defense; failure to act in a timely manner could jeopardize your chances to get the protection you deserve. At Silver Law PLC, our extensive experience gives us a comprehensive understanding of the procedures involved in innocent spouse relief proceedings, as well as the different levels of appeal. We know how to work through the system to get the best possible outcome. To set up an appointment, contact our office or call us at 480-429-3360. We are available to meet with you weekdays from 9 am until 5 pm, and evenings or weekends by request. We are located in Kierland. When Does Tax Litigation Require the Assistance of a Business Firm? What is the Statute of Limitations in Federal Tax Cases? When Can Overdue Corporate Taxes Lead to Personal Liability?